The year 1890 saw several freemasons settled around the district of Mission some 40 miles east of Vancouver on the mainline of the Canadian Pacific Railway. Many of these brethren were railway men. Plans for the formation of a Masonic lodge began early in 1891. On March 9 of that year the petition for a dispensation was submitted to Grand Lodge of British Columbia, signed by W. R. Dunn as Worshipful Master, J. B. Cade as Senior Warden and M. F. Hook as Junior Warden. The petition was recommended by Union Lodge No. 9 of New Westminster. The dispensation was granted and Pacific Lodge was instituted effective April 20, 1891 and signed by Grand Master M.W. Bro. Marcus Wolfe and Grand Secretary V. W. Bro. C.O.J. Quinlan. W.R Dunn........... W.M. Wm. McGillivary....J.D. A. York .............. Sec-treas. Donald McKay ..... Inner Gd. William R. Dunn had affiliated with Cascade Lodge in 1888 and was its third J.W. in 1891. Frank Shook was initiated in Cascade Lodge in 1889. The great initial success, therefore of Pacific Lodge may be attributed in a large measure to the excellent work of Cascade Lodge member J.B. Cade. He was a member of King Solomon Lodge of Thamesford Ontario and was very familiar with the Canadian Ritual which became the ritual for Pacific Lodge. John Boyd of Maxville Ontario was also a charter member. The first few meetings of the newly formed lodge were held at one of the offices of W.R. Dunn. Then the lodge meetings were held in a room in a nearby building. The Lodge then met for several years in the “Old Wo Chong” building on Horne Avenue which later burned down. As the membership of the lodge was largely made up of C.P.R. employees, it was nothing for members to come down from nearly 90 miles from North Bend to a meeting. A great attraction was the pork and beans supper that followed the meetings in the wee hours of the morning. By the time that Grand Lodge met, Pacific Lodge had seven entered apprentices initiated. As the ritual was consider very satisfactory, the charter was granted and dated February 5, 1892 but was withheld until W.R. Dunn completed his term of office as J.W. in Cascade Lodge. In the meantime a new lodge hall was completed by Bro. J.B. Cade. The next important event occurred at mission on April 20, 1892 when the Grand Master M.W. Bro. M.W. Bro. Marcus Wolfe convened a special communication of the Grand Lodge for the purpose of constituting Pacific Lodge, dedicating the hall and installing the officers. He was accompanied by R.W. Bro. William Downie, the Deputy Grand Master, who, with W. Bro. Dunn and the members of Pacific Lodge assisting him, conducted the impressive ceremonies. There were very few changes in the officers: E. Davis was installed as organist; John Boyd as Director of Ceremonies; F.J. Lazenby and T.H. Nichols as Stewards. It is matter of record that the Grand Master praised and complemented the Brethren on their energy and zeal in erecting their own Lodge premises and that the Lodge room more than favourably compared with any other city in British Columbia. He also noted that the increase in membership was large and considered that, judging from those present, the material was the best and that the exemplification of the Entered Apprentice Degree reflected the highest credit on a young Lodge and evinced careful practice and a desire for proficiency. Likewise the deputy Grand Master considered the degree work correctly exemplified, as he, like the Grand Master was a good ritualist and thoroughly conversant with Canadian work. Thus the reputation for the work was well established in the early days of Pacific Lodge. A reputation which throughout the succeeding generations of Pacific Brethren have endeavoured with a good measure of success, to maintain and uphold. He visited the Lodge again in June of that year and installed the officers for the ensuing year. His opinion was that the Lodge was progressing favourably and as rapidly as time would permit. Also that that the conferral of the Entered Apprentice Degree that he witnessed was the best work he had even been privileged to see by a new staff of officers. One cannot help but note the example of zeal and devotion of the early members of Pacific Lodge which continues in our Brethren today. The year of the flood of 1894, or the “Ninety-four Water” as it was frequently called in the Fraser Valley, was a disaster to many of the Brethren and doubtless added to the difficulties that Pacific Lodge experienced in the following ten years. Members were scattered over a wide area, applications decreased, suspensions increased and repairs to the Lodge building were necessary following flood damage. In 1899 when R.W. Bro. H.H. Watson was the Deputy Grand Master, Pacific Lodge came under severe criticism and when he became Grand Master he threatened to withdraw the Warrant. This was a very low point in the fortunes of the Lodge. Membership was only thirty-nine and the average attendance was only eight. It was suggested that Hammon might prove to be a better location. This was rejected by M.W. Bro. Watson whose profound conviction was that small, indifferent lodges as this one was did Freemasonry a great deal of harm. However Pacific Lodge was not without good friends in the person of M. W. Bro. Downie and M.W. Bro. Armstrong of New Westminster who successfully intervened and staved off disaster. Improvements continued to be slow in Pacific lodge and two years later in 1901, District Deputy Grand Master R.W. Bro. Logan said on one occasion that due to the scattered nature of its membership, Pacific Lodge was practically a lodge on wheels because most of the members were in fact C.P.R. employees. There is no doubt that their duties did indeed, often interfere with their Lodge attendance. W. Bro. Harry Fooks reminiscing at the Sixteenth anniversary of Pacific Lodge, and in reply to the toast to the Pioneers of Pacific , said that when he was master in 1905and 1906, he recalled having to propel an old-fashioned speeder from Mission to Agassiz following a Lodge meeting to attend to his duties as an employee of the C.P.R. In order to aid and assist membership attendance, meetings were held for a period of time on Wednesday following the full moon and Lodge notices were handed out at the beginning of each meeting. In 1906, an interesting event for Pacific Lodge was the election of M.W. Bro. Schofield, as Grand Master for he had been Initiated, Passed and Raise in Pacific Lodge and had been secretary in 1892. When he visited the Lodge he was greatly pleased to note that the indebtedness had almost been cleared off and the room nicely fitted up. This year appears to have been the turn of the tide for in 1907, Grand Master M.W. Bro. Francis Bowser congratulated the membership for their loyal adherence to their lodge, under adverse conditions and that this loyalty had brought their own rewards. The property was clear of all encumbrances and was revenue producing. 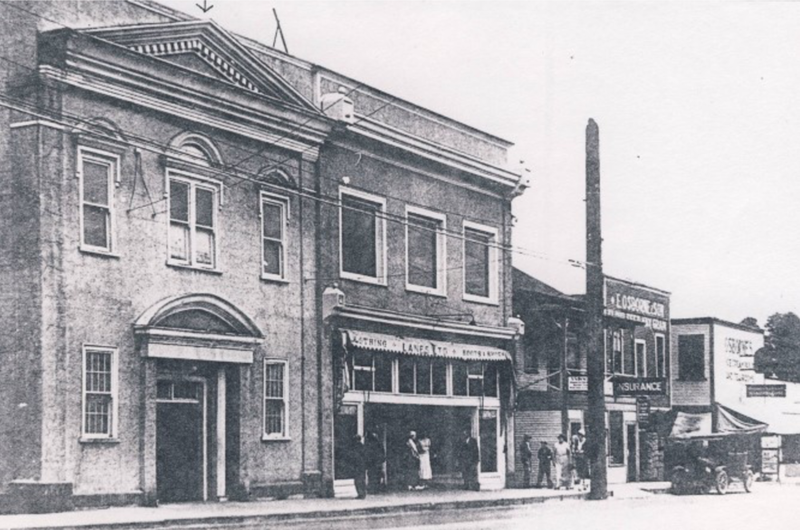 This was explained by the fact that a new building had been erected at the corner of Washington Street, (Now Main) and Welton and that The Canadian Bank of Commerce had leased the ground floor. The formal opening of the new building was October 22, 1907. In the following year this material progress was confirmed by M.W. Bro. Houston who said “The members of this Lodge are widely scattered, some residing many miles from the lodge room, but through untiring zeal, they have struggled upwards and onwards, until they have secured a splendid hall, with every accommodation, handsomely furnished, and free of debt”. It should be noted that on the occasion of the opening of the new building by R.W. Bro. Fred Simple D.D.G.M., there were eighteen Past Masters of the Lodge present. A few years later W. Bro. J.A. Calderwood said that there was an unbroken line of thirty five Past Masters, and we believe a few more were added to that number before there was a break in that long line. Indeed it became a popular saying that the best guarantee one could acquire for a long life was to become a Master of Pacific Lodge. Down through the ages as stated previously, peace and harmony has been one of the great and outstanding characteristics of Pacific Lodge. There has never been a serious division over any question, with one exception and this was concerned the site for the new building in 1922. When the decision was finally made for the building of the new Temple on the old site, there was some dissatisfaction resulting in one Past Master taking his demit because the Master’s station would not be in the East. The same question came up many years later in Nechako Lodge No. 86 in Prince George, B.C. when the matter was taken up with the Grand Secretary, V.W. Bro. W.A. DeWolf Smith as to whether the Masonic East must be in the geographical East. The answer came back, both brief and characteristic “Where the McGregor sits, that is the head of the table”. On May 2, 1951, Pacific Lodge celebrated its sixtieth anniversary and the occasion was made on the “Annual Master’s Night”. The Master Mason Degree was conferred with Past Masters occupying the various offices. The Grand Master M.W. Bro. John H.N. Morgan, was represented by R.W. Bro. Laurence Healy, Senior Grand Warden, whose eloquent address both in the Lodge Room and at the Banquet was warmly received and highly appreciated by the assembled Freemasons. In 1956 following the passing to the Grand Lodge Above of W. Bro. A Stephen, Worshipful Master in 1921, it was learned that a generous bequest had been made to Pacific Lodge by our Worshipful Brother and that this had so increased our Lodge finances that it was generally agreed that, with good care and management, problem of financial matters of the Lodge would not be of concern in the foreseeable future. On April 5, 1967, the Lodge celebrated its 75th anniversary. There were 53 members present together with 140 visiting brethren representing 25 lodges and R.W. Bro. Clark, D.D.G.M. of District No. 18, representing the Grand Lodge. The Lodge was presented with a beautiful plaque commemorating our 75th Anniversary by the Worshipful Master of Zenith Lodge. Cascade Lodge No 12 also presented our Lodge with a book on the history of their Lodge and a bouquet of beautiful flowers. Our Worship Master, W. Bro F. Furness was unable to attend so W. Bro. G.S. Brown was in the chair. The acting W.M. thanked all the Brethren for attending and a most enjoyable hour was spent in the banquet room. An unusual event was held on February2, 1982 when the Worshipful Master of Pacific Lodge W. Bro. William Fooks, together with his officers conferred the Master Mason Degree on Bro. Isfeld in Abbotsford LodgeNo. 70. This brother had received his Entered Apprentice and Fellow Craft degrees in a Canadian Work Lodge in Manitoba. The Master of Abbotsford Lodge Worshipful Master W. B. Brady remarked that as far as he knew, the Canadian Work had never been performed before in Abbotsford Lodge and he congratulated the Worshipful Master and the officers for a job well done. A surprise visit was made to Pacific Lodge by Grand Master M. W. Bro. D. Phelps in 1983. The Lodge was conferring the Fellow Craft Degree by Worshipful Master W. Bro. Donovan Bird and his officers. Needless to say the candidate was nervous but carried on. The Grand Master noted that this was the only occasion during his term that he could see the F.C. degree and congratulated the Lodge and its officers for their excellent ritual work. |On February 22, 1992 the lodge celebrated its 100 year anniversary. The lodge was opened with the attendance of the Grand Master M.W.Bro. Ed Hearn, D.D.G.M. of District No.18 R.W.Bro. Don Birdsill and including V.W.Bro. Don Bird, Grand Stewart. In attendance were 28 Brethren from Pacific Lodge and 42 visiting Brethren from lodges in the lower mainland. In his address, M.W.Bro. Hearn congratulated the Lodge on its past success and wished it good luck on the next 100 years. A banquet was held later that evening at Matsqui Community hall where the GM and his suite were piped in by Douglas Bird, V.W.Bro. Bird’s son. W.Bro. Gerald Kion presented a history of Pacific lodge. A dance after the banquet concluded the very successful event. During the next 25 years, much time had been spent on the Lodge Building, keeping it in good condition and retaining some of the ancient and beautiful features. However as time went along and as membership started to decrease and with increasing costs of upkeep and operating expenses, it became a concern that the upkeep of the building along with operating cost would put a severe strain on lodge finances. There was an interest express by the neighbour, The Bank of Nova Scotia of possibly purchasing the building for their expansion, but that never materialized. In 1998 a motion was passed to put the building on the market, subject to a favourable offer not less than $175,000. One offer was made for less and had many other conditions, it never proceeded. The Lodge did get a financial boost of $7500.00 from Kent Lodge when it amalgamated with Ionic Lodge No. 19 in Chilliwack. By 2004 the Lodge was not doing well and M.W. Bro Clarke spoke the Brethren at the meeting about finding ways to keeping the Lodge going and keeping the memories that could not be replaced. A year later a committee was formed to investigate possible amalgamation with another lodge. The Lodges finances were in serious condition and discussions were held on what other lodges that had experienced similar condition had done. Further discussions were held regarding selling or leasing out the building and on July 27, 2006 an agreement was signed with a local dance studio to lease the building for three years with option on another 3 years. The furniture and Masonic paraphernalia were removed and put into storage. Arrangement was made to start having our communications at Abbotsford Masonic Temple Society in September and this arrangement is still continuing. The membership continued to decline and by 2010 had reached into the twenties. With the support of the Brethren and many affiliating past masters, an active program of attracting new members was launched under the leadership of R.W. Bro. John Fleming who served as W. M. from 2009 to 2013. The membership now stands at 60. 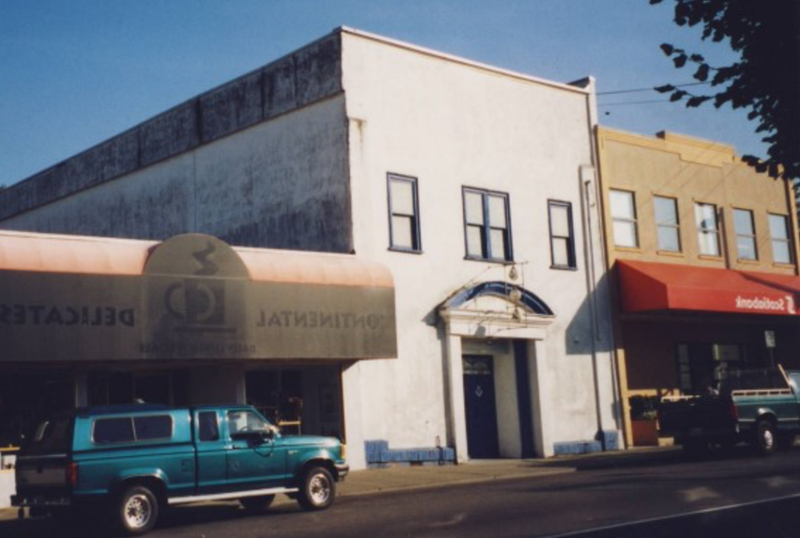 In 2013 an offer to purchase the building in Mission was made by the tenant and was accepted by the Brethren of the Lodge, thus this sad but necessary event took place, ending the Lodge’s visible presence in Mission. However over half of the current Brethren of Pacific Lodge still reside in Mission and continue to maintain contact and a strong presence in that city, supporting community programs such as bites for Books, which encourages elementary school children to participate in active reading. Despite a history of obstacles and ups and downs, the lodge has survived and is doing well. One outstanding feature for which Pacific Lodge has been known for throughout the region and which is of great pride amongst our members, is the quality of the ritual work and brotherhood.